Less is more - or something like that. The BOgear Subbie is a pack that embodies this idea. The Subbie was designed to retail for under $100 AUD (around $70 USD) and this is where it draws it's name. The pack is trim and svelte to accomplish this, as well as produced abroad. Read on for more details! I traded into the Subbie in an effort to get a small backpack for laptop carry 1-2 times weekly. I was after something that would not be obtrusive on public transportation, but that could still pack what I need for mobile office days. The front of the Subbie looks like many of BOgear's other packs. It has 4 rows of their "clipping webbing" (the columns are 2" wide, not 1.5" as found on standard MOLLE/PALS) and a strip of reflective tape at the bottom. On both sides are bottle pockets made from stretch mesh. These should hold 1L bottles. The zipper for the main compartment also runs about half way down the sides. Located above the clipping webbing is the one external pocket on the Subbie. This is a simple flat pocket with a zipper closure under a storm flap. The pocket is fairly shallow; you can see the seam above the top row of webbing. The straps on the Subbie are contoured and well padded. They use 3/4" webbing throughout and include an elastic keeper. Please note: the Subbie DOES NOT include a sternum strap. The one pictured here I added. The rear panel of the bag does have a light piece of foam sewn inside it. This provides just a little structure. 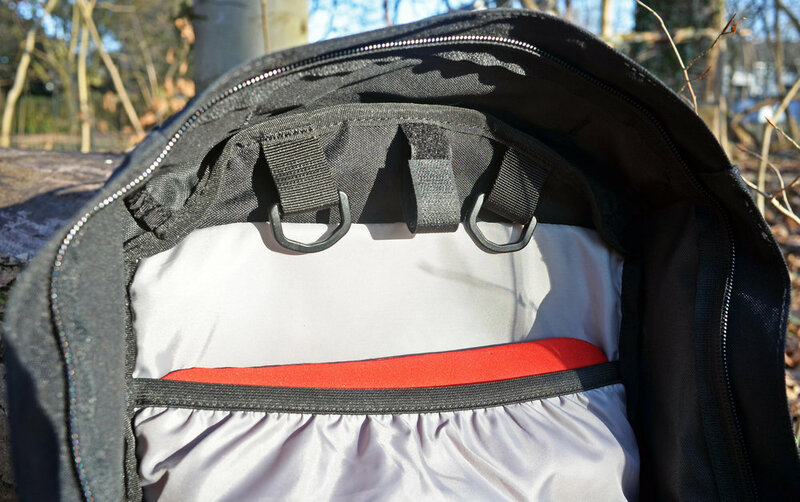 Inside the front flap of the Subbie is a billowed mesh pocket with a zippered entry. On the rear wall of the bag you can see 2 d-rings and a velcro loop for hanging pouches and/or a hydration bladder. There is a slot in the top for a hydration bladder tube to pass through as well. On the rear wall of the bag there is a sleeve that is suitable for a hydration bladder or a smaller laptop. Here I have my 13" MacBook Pro in a lightweight neoprene case. The sleeve is not padded on the front, sides or bottom. The rear of the sleeve is up against the foam lined back panel of the bag. Here you can see where the hydration hose exits the bag. It can be routed to either shoulder strap. The suspension is very good for a pack with size (once I added the sternum strap). The shoulder straps are great. I primarily carried it with my laptop in the sleeve, so that provided some structure. Loads up to 15lbs were no big deal. Organization was decent for such a trim little pack. The interior pockets and attachment points provide a lot of options. Accommodates a decent sized laptop in the sleeve (my 13" MBP is maxed out in there). Lightweight and trim - it works well on public transport. Reflective tape is great in the city. Easily flattens down if it needs to be packed away. Quality and construction is very good. Lacks sternum strap - a big oversight in my opinion. The pack does not carry well without it. For an imported pack, this should have been included. Lacks some sort of frame sheet - the pack just has too little structure without it. It flops around and cannot really support any pouches that one might add on. The d-rings are a great idea, but they do not work well with out a frame sheet (see above point). Anything you hang there will make the pack collapse inward on itself. The main zippers and the one on the external pocket tend to catch on the storm flap. They are either too small, or the storm flap is too wide. This is a pretty annoying issue. The sleeve pocket will accommodate a laptop, but it is hard to access given the depth of the bag. This is not a quick or convenient carriage solution for your notebook. The Clipping Webbing is not built to PALS/MOLLE spec and may cause compatibility with mounting wider pouches. I really wanted to like the Subbie. The size and specs work well for me, but in practice, the bag does not work well in the way I intended to use it. It is simply too floppy, lacks the proper layout and the zipper issue too great to be considered for everyday urban use. That said, this pack would fit certain other roles very well. If one needs a lightweight pack to toss in the bottom of the suitcase, this is a prime candidate that will include some basic organization. The Subbie also might serve one well as a light hiking pack, if a sternum strap were added. The Subbie is a mixed bag. Really. Were a sternum strap and frame sheet included, I'd recommend it without hesitation. As it is, I think it is only a questionable value, even at just $70 USD. If a lighter role is what you intend for it, this might be just the thing. But if heavy or demanding use in mind, you better look elsewhere. Carry on everyone and may God bless you! For more info on this bag, please visit the BOgear website.